The names of the core properties (Maximum, StepFrequency, and Value) are borrowed from the Slider class because after all –just like the slider- a Rating control is just a control to set and display a value within a range. slide horizontally over the control to decrease and increase the value with StepFrequency steps. 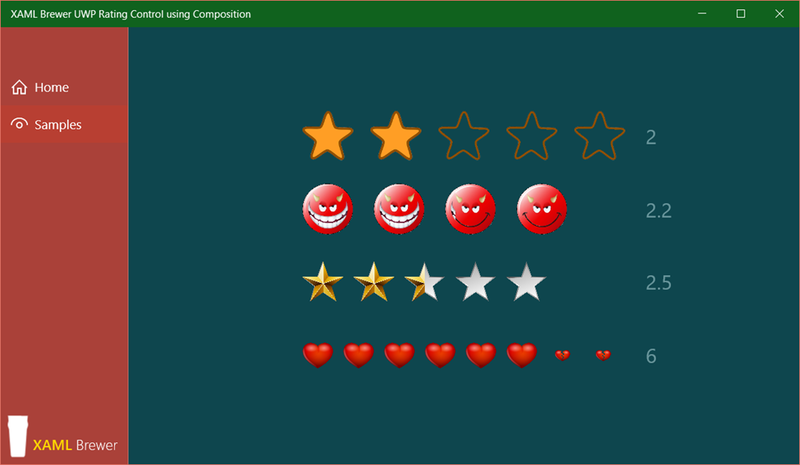 The UI of the control is drawn entirely using the Composition API, so I kept the XAML template as simple as possible. I was tempted to use an ItemsControl as basis, but went for a Panel.. 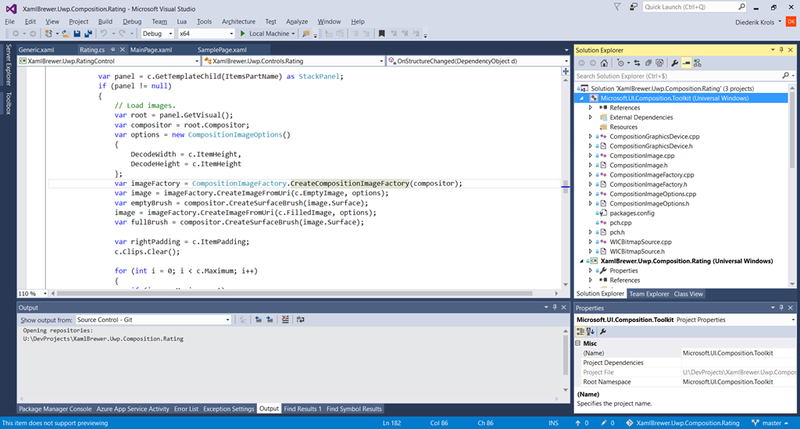 If the control were purely XAML, then a horizontal StackPanel would suffice as ControlTemplate. The star (or other) images will be displayed using the Composition API, in a layer on top of that StackPanel. This layer makes the panel itself unable to detect Tapped or ManipulationDelta events. The template contains extra Grid controls to put a ‘lid’ on the control. 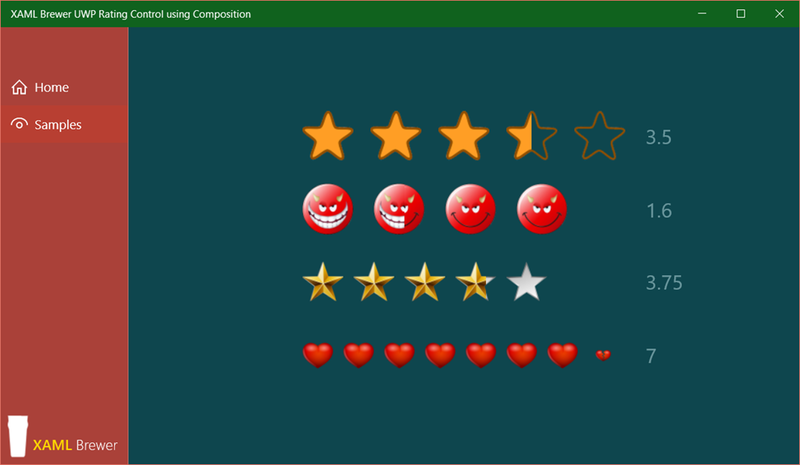 The control template makes the distinction between the part that displays the images (PART_Images), and the part that deals with user input (PART_Interaction) through touch, pen, mouse or something else (like X-Box controller or Kinect – remember it’s a UWP app). All properties are defined as Dependency Property, which allows two-way binding in XAML and automatic property change notification. All of the properties also have a default value, so that the control can be used immediately without specifying mandatory property values. And last but not least, all of the properties have a PropertyChanged callback in their PropertyMetadata, so the UI of the control is updated automatically at runtime when one of the properties changes. The dependency property registrations use the nameof() expression instead of a hard-coded string [which is still in the propdp code snippet]. // Ensures that ActualWidth is actually the actual width. The OnstructureChanged method is called when the control is rendered initially, or whenever one of the main UI characteristics is changed (things like item height or padding, maximum, ore one of the images). The images come from reusable brushes and are never reloaded at runtime, so I think that this rating control is very efficient in its resource usage. // We assume that fraction is a value between 0 and 1.
sliding to adjust more precisely. 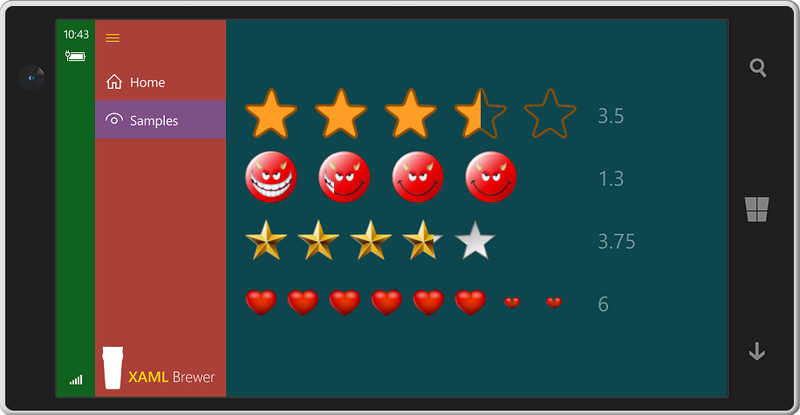 The XAML-and-Composition Rating Control for UWP lives here on GitHub, together with the sample app. 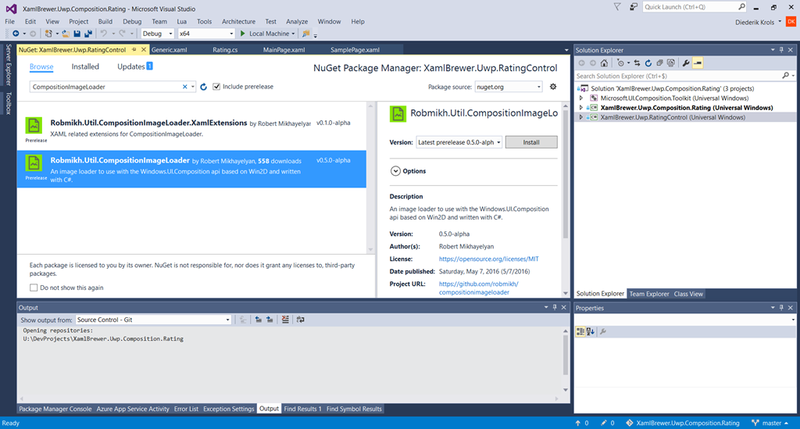 This entry was posted in Composition API, User Controls, UWP on July 11, 2016 by xamlbrewer.